The Castle is a popular destination, so it is wise to make it the first stop and, once there, get tickets immediately. Depending on the time available before your tour begins, there are a few decisions to make. If you have an hour or less, then explore the grounds; visit the gift shop and the snack bar. If you have longer, there will be time to drive to Ubehebe Crater. The swimming pool is a good place to begin. It was more a dream than a reality, but what a dream it was! Had the 270-foot pool been completed, it would have rivaled that of kings'. From this vantagepoint, look out over the land; try to envision reflecting pools, ponds, fountains and two man-made lakes. Finished, it would have been a real-life mirage in the desert, but like so many other dreams, the 1929 Stock Market Crash kept it from becoming a reality. The nearby powerhouse had the difficult task of supplying this isolated place with electricity. To make use of the abundant water supply from the nearby springs, a hydroelectric generating system was installed using a 7-kilowatt General Electric dynamo powered by an 18-inch Pelton waterwheel, driven by gravity-fed water. As the Castle's energy needs increased, the system was upgraded, but the Pelton waterwheel is still used today to supply electricity for evening lighting. After investing thousands of dollars and receiving no return, Johnson decided to personally check out the mine, despite the fact that his health was not good. Because the dry, sunny climate improved his health dramatically, Johnson and his wife made frequent visits to the Valley which, in turn, led to the building the Death Valley ranch. 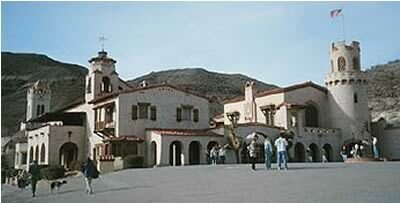 The 3,000-foot elevation and reliable year-round water supply made the site ideal. Johnson supplied more than $2,million needed to finance the project, but Scotty supplied the mystery, curiosity and entertainment. Over the years, many came to visit including Betty Grable, Will Rogers and Norman Rockwell. The Main House, a replica of a Spanish manor house and Annex are the focal point of the estate. 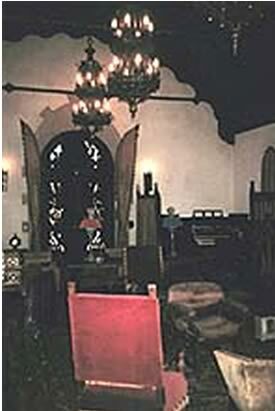 The Great Hall served as the living room and is where Scotty entertained Johnson's guest with his many stories. Besides the Johnson's personal suite and guestrooms, the Upper Music Room houses a huge Welte-Mignon theater organ with more than 1,000 pipes. 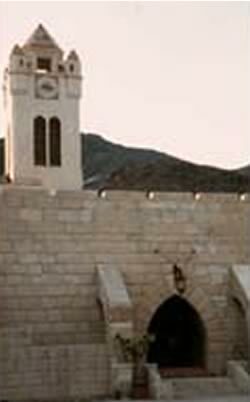 Scotty's Castles is one of the more incongruous and unique man-made destinations found in Death Valley. Not far from Scotty's Castle is one of nature's special creations -- Ubehebe Crater. Round trip from Scotty's Castle should be less than an hour. Around 6,000 years ago a powerful volcanic explosion created a crater a half mile in diameter and more than 500 feet deep. 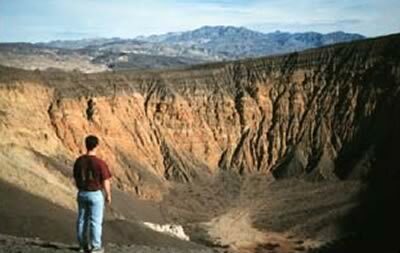 Ubehebe Crater is the largest in a series of craters found in the area. All were formed when molten lava came in contact with groundwater, causing a series of powerful steam explosions. There are several trails including one to Little Ubehebe, only 5 minutes away and a 1.5-mile hike around the rim. It is possible to hike to the floor of the crater, viewing the many different colored bands of rock on the crater walls, but the climb back up is steep! Near Scotty's Castle there are many other interesting sites: deserted mines, sand dunes and Salt Creek. At Salt Creek, the endangered Pupfish, a "living fossil" stranded in the spring 10,000 years ago can be seen in the water next to the trail from March to May. Death Valley holds many wonderful surprises for the visitor, from castles to craters, from beautiful sunsets to singing sands. For some, like Scotty and Albert Johnson, the lure of the desert was so strong that Death Valley became forever an integral part of their lives.